I love the Query Store. Seriously. It’s a huge leap forward in the capabilities of Azure SQL Database and SQL Server in support of performance monitoring and query optimization. One of my favorite aspects of the Query Store is the ability to force plans. Frankly though, it’s also the scariest part of the Query Store. I do believe that plan forcing will be one of the most ill-used functions in SQL Server since the multi-statement table-valued user-defined function (don’t get me started). However, unlike the UDF, this ill-use will be because of poor understanding on the part of the user, not a fundamental design issue. No, plan forcing and the Query Store are very well constructed. Let me give you an example of just how well constructed they are. Let’s imagine that have a situation such as bad parameter sniffing where you’ve determined that from the more than one possible execution plans against a table, there is a preferred plan. Enabling plan forcing to ensure that plan gets used is a no-brainer. Let’s further imagine that you have a junior DBA who is… let’s just say overly aggressive in their duties such that they do silly things occasionally. What happens when your pretty plan, which uses a particular index meets your junior DBA who just dropped that index? That’s it. I’m happy because I’m going to see the execution plan used over and over, despite any values passed during a recompile. Index ‘WideWorldImporters.Warehouse.StockItemTransactions.TransactionOccurredWhenNCI’, specified in the USE PLAN hint, does not exist. Specify an existing index, or create an index with the specified name. The first question now is, what happens with this query and the execution plan? Does the new plan generated now that the index is missing get stored in cache? Yes, it does. We can validate that by querying the cache, or, when capturing the actual execution plan, checking the “Retrieved from cache” property. Because plan forcing is enabled, do we see a recompile every time this query is called? The answer to that question is slightly complex. Under normal circumstances, no. As long as that plan remains in cache, it’s simply reused. No other recompiles occur. 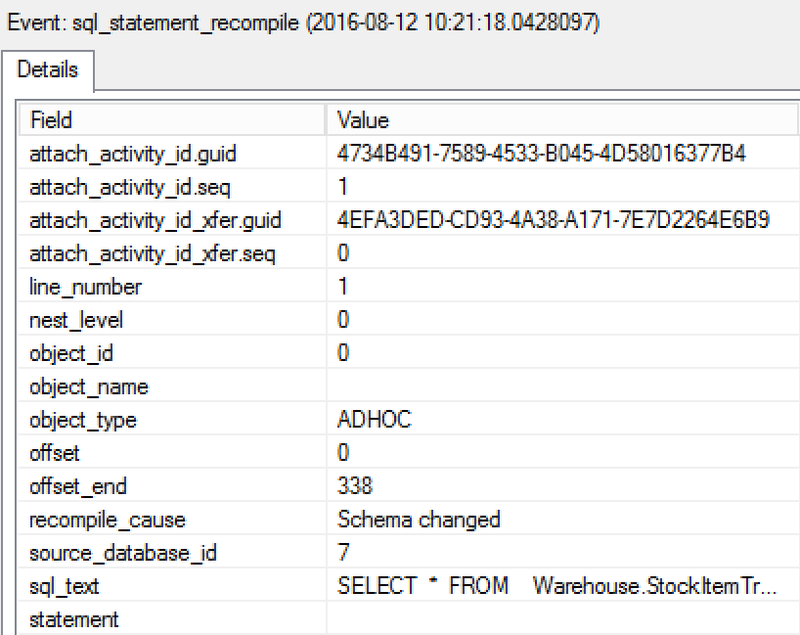 A normal recompile event will cause another attempt at applying the invalid execution plan and we would see yet another query_store_plan_forcing_failed event for each recompile on the query. However, during testing, Joey D’Antoni (who was helping me play with this when we discussed what would happen when a plan was made invalid) had severe memory pressure on his server. He saw intermittent recompiles with a cause message that said plan forcing had failed. So if your server is under extreme stress and you cause this issue, you might see different messages. Just remember, the cause of the recompiles was not the plan forcing, but the memory pressure. The fun thing is, as long as I don’t remove the plan forcing or take the query and plan out of the Query Store manually, if I recreate the index on my table with the same name and definition as that expected by the plan, the Query Store will simply reapply the plan and then successfully force it during any subsequent recompile situation. This is because Query Store is persisted with the database and barring outside activity, the information there will remain, just like the rest of the data in the database. All of this means that Query Store works exactly the way we would expect, not forcing additional recompiles when you, or your junior DBA, inadvertently invalidate a plan. It also works as expected in that forcing a plan is stored with your database so that, assuming you don’t remove that plan from the Query Store, it will simply be reapplied after you fix the problem. It’s fun to see the thought that went behind the design of the behavior of Query Store. However, please, use plan forcing judiciously. Thanks for blogging as promised at SSGAS 2016 🙂 So, the issue was little different from what we discussed. Yes. As long as the plan is in cache, it keeps getting reused. If the plan ages out of cache or statistics updates force a recompile, you will see another attempt at forcing the plan, which will fail because of the missing index, a proper plan will be created and it will be reused. In short, it functions more or less as we would expect it to. However, it was absolutely worth checking. Thanks again for such a great question.